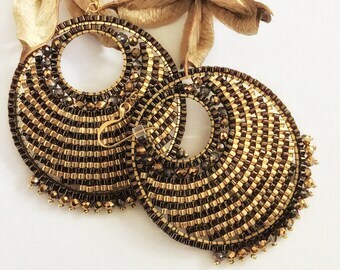 This listing features a pair of statement boho chic earrings with long impressive beaded fringe. After beading the ‘Twilight Cross’ necklace, I decided to make a pair of earrings with similar pattern. So, I designed and crafted this pair with love, patience and care, using premium quality Japanese glass seed beads in opaque white, matte black, shimmering metallic gold and shiny turquoise color. I have used an extra durable thread for bead weaving. The beaded items are tightly woven around golden colored metal findings in square shape. The earrings dangle from gold plated ear hooks which come with silicon stoppers. Like all SouSou earrings, this pair is surprisingly ligh-weight; you can hardly feel them on. SouSou jewelry is made only with the highest quality materials to ensure its beauty and durability. With proper care, SouSou jewelry is made to last! My designs are inspired by colors, sparkling crystals and Greek summer! I simply love picking the perfect beads for every special creation. Through bead-weaving I find harmony in myself. I hope the same harmony is offered to you through my creations! Glass beads are not fond of water! These pieces are delicate. Please don’t wear your jewel while bathing, swimming or doing sports. Don't put perfume or body lotion on any of the handmade items. If you like the design but prefer a different color combo, please feel free to message me. All SouSou jewelry is carefully packaged in a gift box or in an organza gift bag and shipped in a bubble mailer envelope, via the Hellenic Post Services (ELTA). I use First Priority Registered airmail, which minimizes the possibility of item loss. Express Shipping can be arranged upon request. As soon as your order is shipped, you will get a notification providing the tracking number, in case you want to trace your package at www.elta.gr (there is an English version). Please note that for a "made to order" piece, you have to allow 5-7 business days before the package is shipped. I will do my best to minimize the processing time, so as to receive your bright new item as soon as possible! Please note that earrings are - for hygiene reasons - excluded from returns. I use craft paper boxes and various matching cords, ribbons and color washi tape. I sometimes place a small beaded charm as a gift. I love the fact that these earrings are not exactly the same. They match one of the bracelets I ordered from Irene. She is the best!!! 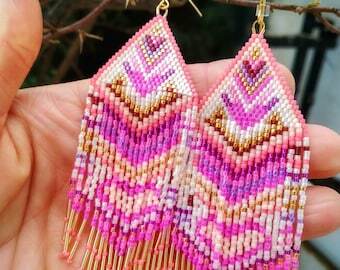 Love these earrings that are a custom design for beaded bracelet!! I love these!!! 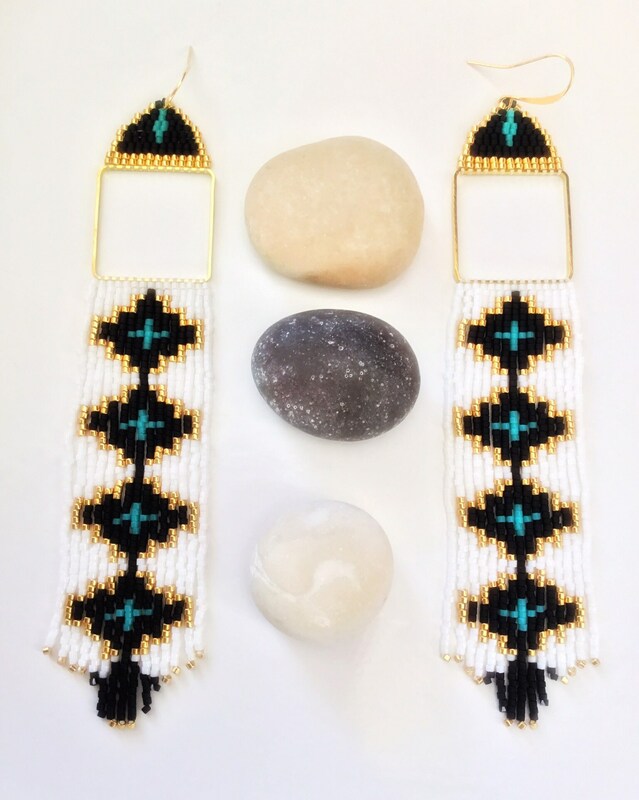 I would love to bead weave something special just for you or simply your favorite color combination! Please feel free to contact me! I can make your size, just message me! Glass beads are not fond of water! These pieces are delicate. Please don’t wear your jewel while bathing, swimming or doing sports. All SouSou jewelry is carefully packaged in a gift box or in an organza gift bag and shipped in a bubble mailer envelope via the Hellenic Post Services (ELTA). I can offer discount in larger orders, please feel free to contact me.